Endodontic treatments – better known as root canals – have a bad reputation. But thanks to modern medicine, anesthetics can be applied before the procedure to eliminate a patient’s pain. Once patients get home, though, it is up to them to be aware of important practices that will help ensure the health of their teeth and a quick recovery. According to the American Association of Endodontists, treated teeth may be sensitive for a few days after the procedure. This is particularly true for teeth that were painful prior to the treatment. Fortunately, most discomfort can be relieved with a simple over-the-counter pain medication or prescription drug. Be aware that the affected tooth may feel different for awhile; however, if you have long-lasting severe pain, it is important to schedule an appointment with your dentist for an exam. Remember: Root canal treatments require a second appointment to fully repair the tooth with a crown or other restoration. Until you have completed this process, do not chew or bite with the untreated tooth, as it is at increased risk of fracturing. In most cases, teeth that undergo endodontic treatment are fully restored and will last as long as natural teeth. Rarely, teeth may need additional treatment if they become deeply decayed or experience another trauma. 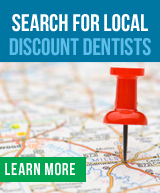 For more information about root canals, talk to a dentist on your True Dental Discounts, dental plan. He or she can evaluate your teeth and recommend the appropriate procedure to protect your oral health.